It has been quite a while since I’ve craved a smoothie. I used to drink them all the time in cold weather, but with each passing year I’m less and less inclined to drink them in the non-summer months. After chilly and drizzly weather last week, though, NYC seems to finally be plunging into summer, and all of a sudden, the smoothie cravings have hit. 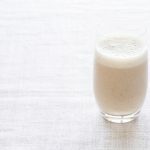 I tend to divide smoothies into two categories: the creamy, thick, dense kind, which is usually what I’ll opt for as a breakfast option, and the frosty, fruity kind, which I’ll most often enjoy as a snack. 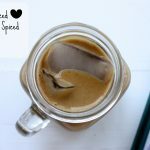 I love those frosty and fruity blends, but they don’t fill me up, which is why my breakfast smoothies tend to be heavier on nut butters, protein powders or hemp seeds, and the like. This smoothie is sort of a hybrid. 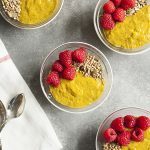 It’s got the look and taste of a frosty, summery concoction, but the addition of chia seeds and avocado give it hints of creaminess and a thick texture. It’s a perfect light breakfast or a refreshing afternoon snack option. And it’s a perfect vehicle for two of the most highly anticipated summer fruits: ripe berries and juicy watermelon. It was my friend Kathy who first tipped me off to the fact that watermelon makes a delicious addition to smoothies. She uses frozen watermelon chunks to add both thickness and sweetness to her blends (especially her famous matcha shake). I was never really in the habit of using watermelon in my smoothies until I read her book, 365 Vegan Smoothies, but now it’s a trick I use all the time. In this particular smoothie, I used fresh watermelon, which adds liquid while also keeping a thick texture. 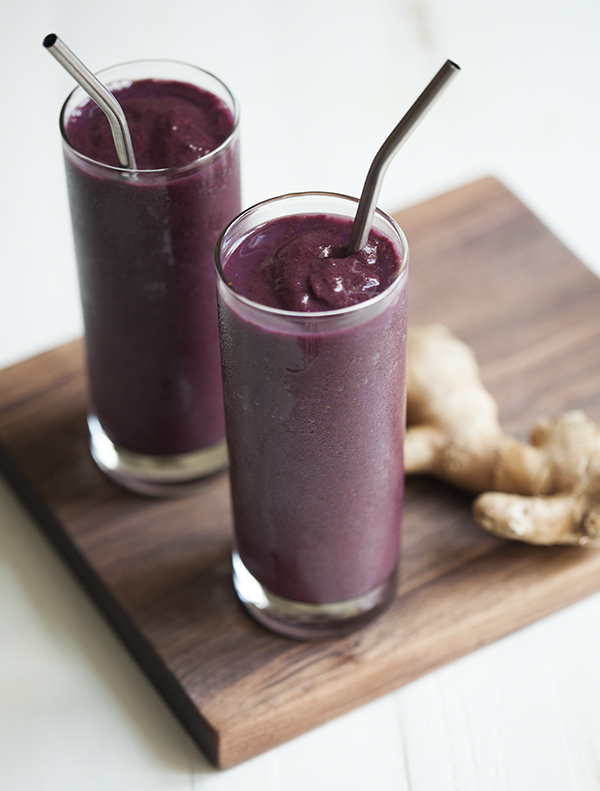 Another superstar ingredient in this recipe is the fresh ginger, which adds both flavor and the anti-inflammatory effects that the recipe name advertises. Ginger contains phenolic compounds called gingerols. One of these, 6-gingerol, has been shown to have anticancer, anti-inflammation, and anti-oxidation biological activities. (1) Not surprisingly, ginger has been indicated as having a palliative effect in inflammation-mediated diseases, such as arthritis, reducing not only pain but also swelling. (2) Gingerol may even play a role in protecting against or encouraging slower growth of colon cancer (3, 4). Inflammation appears in tandem with many chronic diseases, especially autoimmune diseases, and it can result in pain, fatigue, and swelling, as well as biological stress. Inflammation tends to encourage the release of cortisol–the so-called stress hormone–which in turn can suppress the immune system. In short, chronic inflammation is nasty business. Stressing anti-inflammatory foods in one’s diet can’t necessarily prevent inflammation, but diet has been shown to play a significant role in mediating inflammation levels. The happy news for us is that so many anti-inflammatory foods–ginger, turmeric, tofu, olive oil, sweet potato, dark cherries, and greens–also happen to be delicious. If you’re looking for a way to incorporate a new anti-inflammatory option into your diet, this delicious summer sip is a nice place to start. 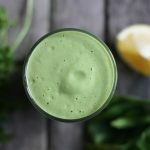 Whether inflammation concerns you or not, hopefully you’ll find a way to incorporate this cooling treat into your day soon. It’s a new favorite for me, and I’m excited to share it with you. Speaking of things that I’m excited to share, I am very excited to share a new cookbook review with you this coming Friday, along with a recipe and a giveaway! 1. Wang, S, Zhang, C, Yang, G, Yang, Y. Biological Properties of 6-gingerol: a brief review. Nat Prod Commun. 2014 Jul;9(7):1027-30. 2. Bartels EM, Folmer VN, Bliddal H, Altman RD, Juhl C, Tarp S, Zhang W, Christensen R. Efficacy and safety of ginger in osteoarthritis patients: a meta-analysis of randomized placebo-controlled trials. Osteoarthritis Cartilage. 2015 Jan;23(1):13-21. 3. Jeong CH, Bode AM, Pugliese A, Cho YY, Kim HG, Shim JH, Jeon YJ, Li H, Jiang H, Dong Z. -Gingerol suppresses colon cancer growth by targeting leukotriene A4 hydrolase. Cancer Res. 2009 Jul 1;69(13):5584-91. 4. Shukla Y, Singh M. Cancer preventive properties of ginger: a brief review. Food Chem Toxicol. 2007 May;45(5):683-90. Epub 2006 Nov 12. Review. Good timing! I was just thinking this morning I need to change up my morning smoothie game and this sounds delicious. 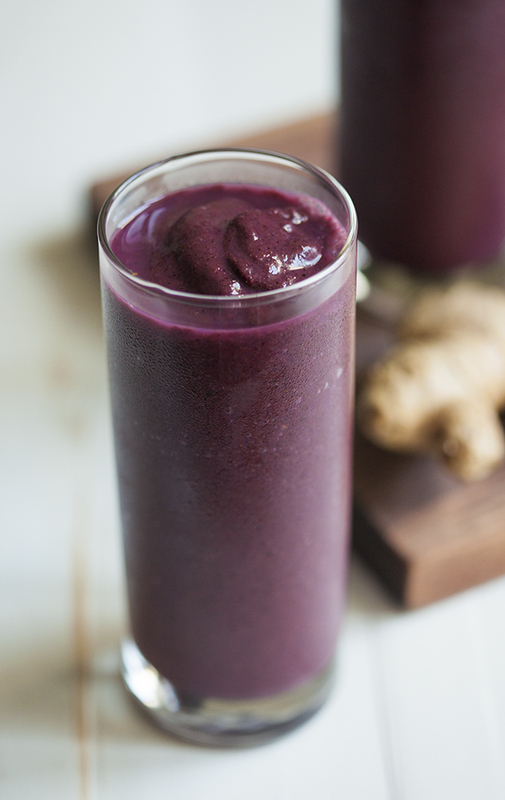 This smoothie is such a gorgeous color! And you have to love the total refreshment that comes with watermelon. Yes! Absolutely gorgeous. I’m going raw this month and need all the tasty ideas I can get. Thanks for the tip on Kathy’s book as well. Yikes – I have Kathy’s smoothie book and still haven’t tried the watermelon trick. Deliciously colored. This smoothie is something I will make myself. This sounds delicious! 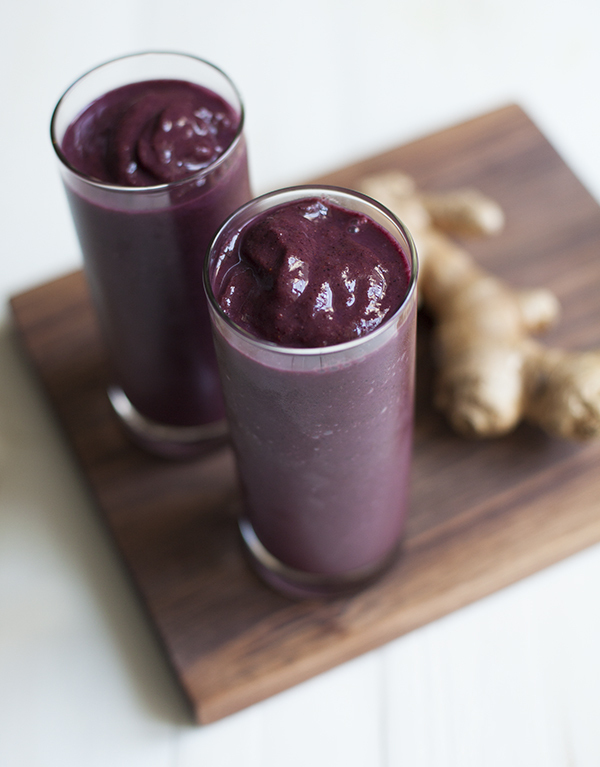 I’m always looking for smoothies that have ginger in them, thanks for sharing! don’t i love the color……….the smoothy looks refreshing. i new idea for my new recipe.thanks to you for sharing. Ginger is one of the best natural anti inflammatory foods. Beets, turmeric, garlic are also great options. I never used to be a smoothie-for-breakfast kind of girl but in the last few months there’s rarely been a day when I’ve not had one! I’m the same as you though in that I like a breakfast smoothie to be filling so always add nuts/seeds, nut butter, protein powder, tofu, etc. I’m working my way through all the recipes in Julie Morris’s wonderful book “Superfood Smoothies”. This is amazing! I just made it except I took out the chia and added a scoop of pea protein- and only one cup of berries, a handful of spinach and a half of lemon. Will make again-thank you. I like to have a smoothie for breakfast when I am on the go. Especially thick smoothies because they do make you feel fuller for longer. 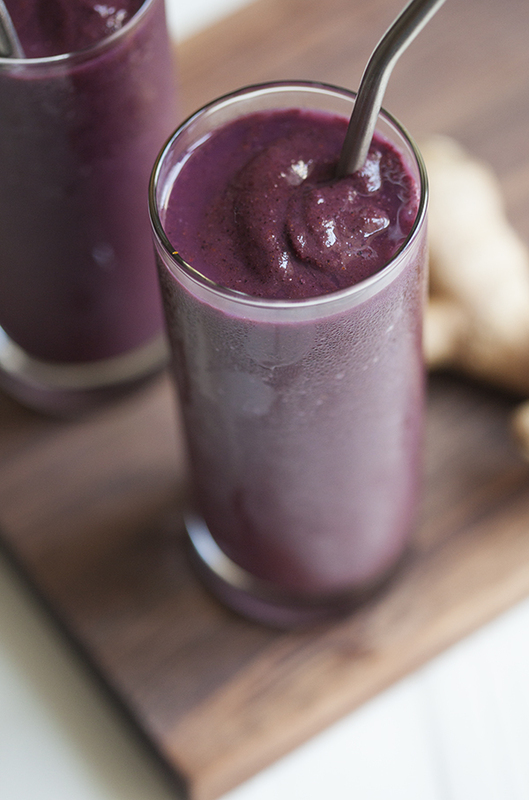 The ginger is what helps with inflammation. If I was to make a different style smoothie using different fruits and added ginger would it still be an inflammatory smoothie? Thanks, i have never known that anti-inflammatory foods especially– sweet potato,can also happen to be such delicious recipes. A very sumptuous meal! Will try it over the weekend.